America's trade watchdog has warned more than 90 celebrities that they need to disclose when they are paid to promote a product – or risk facing an investigation. Among the red-faced celebs: David and Victoria Beckham, Jennifer Lopez, actresses Shay Mitchell and Vanessa Hudgens, and most of the Kardashian clan – Kourtney, her mostly drunk husband Scott, and Pepsi embarrassment Kendall Jenner. US regulator the FTC acted after advocacy group Public Citizen sent a letter [PDF] back in November complaining about the blatant endorsements on social media network Instagram where the "influencer" failed to disclose they had been paid. The letter included screenshots of each. In response, the federal regulator's consumer protection bureau sent out letters "reminding" them that they "should clearly and conspicuously disclose their relationships to brands when promoting or endorsing products through social media." As well as providing a slapdown, the FTC pointed to a copy of its extensive guidelines that outline exactly what it expects people being paid for hawking products to do. For example: include the "material connection" they have to the company above the "more" link in Instagram streams. And don't try to hide your #whoredom in a series of hashtags. Last year, the FTC formally warned fashion retailer Lord & Taylor about paying people to post pictures wearing one of its dresses without disclosing the fact. It did not impose a fine, but noted that it is able to charge a civil penalty of up to $16,000 per violation, so the company faced an $800,000 fine if it repeated its actions. While some of the endorsements were blatant – such as actress Vanessa Hudgens weirdly holding open a box of "Graze" snacks and noting that she is "obsessed with @grazeusa. Snacks just make life better #Grazesnacks" – in others it was hard to make out the product past the "influencer's" half-naked body (who'd have thought that posting pictures of yourself in your underwear would gain followers on social media?). Ever the class act, Scott Disick – who literally makes his living by endorsing products and appearing on TV being a dreadful person – didn't even bother to pretend, providing a promo code for Lyft plastered across his image. As with a growing proportion of the posts flagged by the FTC, Disick has since taken the images down. While the FTC takes the careful approach of simply noting the posts and reminding celebs of the rules, Public Citizen is less coy. "Non-disclosed advertising is rampant," it complained, noting that its list of 113 "influencers" was only "illustrative, not exhaustive." It goes on: "Instagram has become a Wild West of disguised advertising, targeting young people and especially young women. That's not going to change unless the FTC makes clear that it aims to enforce the core principles of fair advertising law." 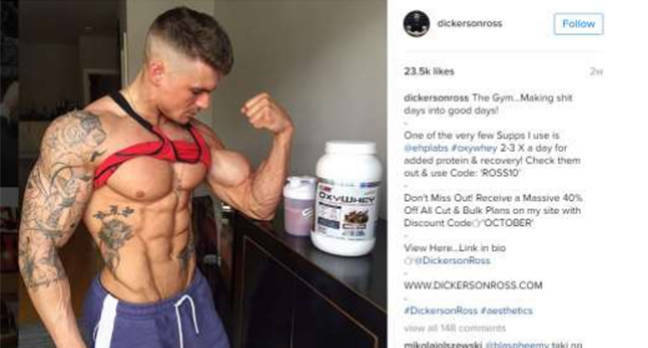 Its president Robert Weissman also argued why it was important: "It is often unclear whether an Instagram user is paid to post a product endorsement or if they genuinely use it. That's exactly why brands are using influencer marketing as a primary way to reach young consumers.